After one more day in Tokyo (I went to IPMU to give a talk on my Cepheids work) we left for Hakone. A small town on a volcanic area west from Tokyo, it is renowned for its thermal waters and hot spring resorts (onsen). Getting to Hakone takes the good part of a day, as the last leg of the trip, from the town to the onsen area up in the valley, is done on a small mountain train literally imported from Switzerland. We were headed to a traditional Japanese inn (a ryokan). 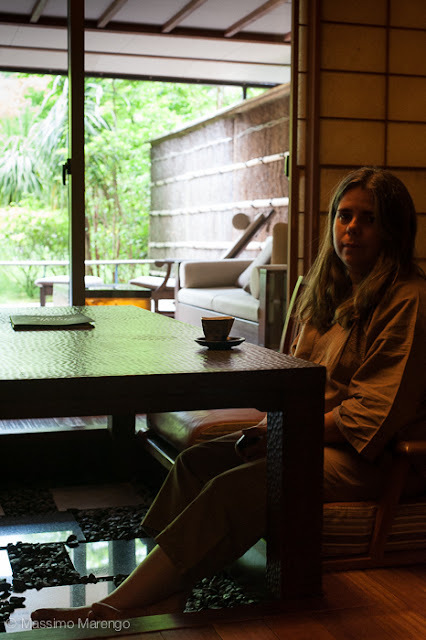 If you have never been in a ryokan, you should: they are kind of expensive, but the price is compensated by the service they offer. You won't just get a place to sleep, but also a traditional style breakfast and dinner, served in your room one dish at a time. 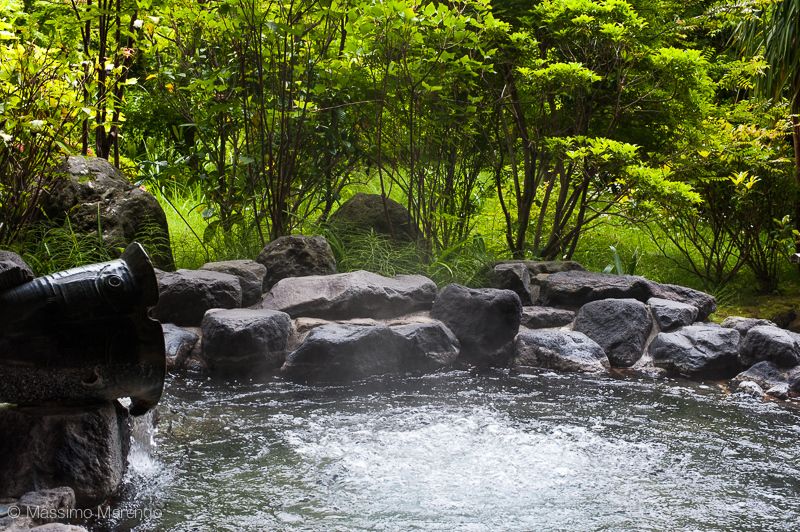 If you are in an onsen area, like Hakone, you also get communal (or private in upscale ryokan) thermal baths using the water from the local hot springs. 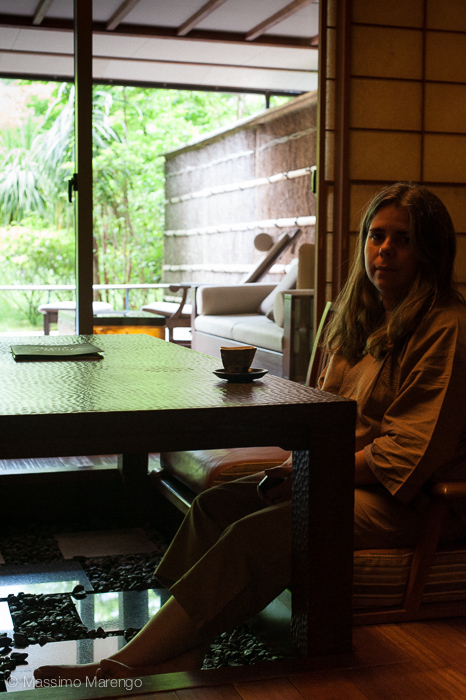 The large photo shows Mayli in our japanese-style living-room, with the view on the garden. As you can see it has a low table where you seat at the floor level (but the floor was lowered under the table for comfort). That table is where we had dinner. However, we previously had tea served on a removable table placed in the bedroom. That table was removed while we had dinner, and the bedding (two futons) set up in its place on the tatami mat covered floor. Our ryokan, the Hakone-Ginyu, offered two stunning communal baths (segregated by gender), one of them was an infinity pool perched on the valley below. Each room also had two private baths, one inside and the other outside of the private garden (see small photo on the left). The water is almost unbearably hot, but feels very good once you are submerged with just your head outside in the cold mountain air. I refer you to any of these sites about onsen etiquette on the web: the basics are that you should wash yourself very carefully (scrub hard) before entering the water, and then make sure you are completely naked when you finally enter the bath. Which makes a lot of sense, especially in the communal bath, where you don't want to bathe in the water dirtied by somebody else or their clothes. We only stayed at Ginyu for two nights (we could not afford more, as those two days costed as much as the rest of our vacation) but those were certainly among the two most relaxing days I can remember.